For use with Combustible Metals, Powders and Dust. Popular ESD Flooring for use with Munitions, Flammables, Explosives and other Energetics. For The ElectraGuard High Gloss System used in Electronics please click here. Today's reality dictates an increasingly daunting task. To meet the latest NFPA or DOD static control standards and assure your successful manufacturing of static sensitive product, ESD flooring is a must! But according to DA PAM 385-64 and many other standards ESD Tiles are not approved for use where potentially explosive particulate is present (due to the seams between the tiles). Yet does it make sense to spend $10.00 per square foot for a THICK Set Epoxy? Most think NOT! 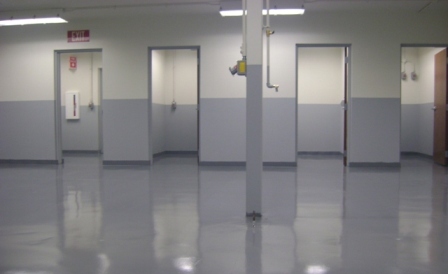 The ElectraGuard ESD Epoxy runs around $1.25 per square foot and that's for three coats! It provides a coating that may be tailored on site to achieve specific minimum resistance levels (if needed). ElectraGuard is nano-particulate infused for extreme hardness yet contains Zero carbon or any additives that may spark. It is Very Popular for use in achieving compliance to NFPA 484-15, DOD 4145.26M and DA PAM 385-64. ElectraGuard has a 10 year plus life expectancy and is without-a-doubt the most wear resistant ESD floor paint in the industry. A proven product at a realistic cost! Reliable and predictable electrical conductivity. Perfect for Mission Critical Static Control. Non Sparking and Made in the U.S.A. Outstanding resistance to concrete vapor emissions. Seamless (when applied over properly prepared substrates). Eighteen Year track record! Life time warranty on conductivity. 24/7 live tech support available at no charge with each order. For use over a multitude of substrates. Concrete, VCT, steel, wood, most paints and thick set epoxies. Millions of square feet installed world wide! Please click Here for Pricing and Discounts on our shopping cart. Please specify ElectraGuard High Velocity in the notes section when completing your order. Please Note: When placing your order for this material through sales or on our shopping cart please specify ElectraGuard High Velocity for an epoxy that test with an electrical resistance of >25 K Ohm and <1 M Ohm at our facility and with our recently calibrated test equipment using 500 volts. What you get with your order: We pretest your dye lot on a 6" x 6" 3/16 insulative Eucatex-Eucaboard using an industry compliant megohmmeter and compliant electrodes at 500 VDC. We test Resistance to ground by attaching a ground lead to the sample and placing an industry compliant 2.5 inch 5 pound electrode on top of the sample. We email you the results of this test and retain the sample and a container of the specific dye lot used for a period of 5 years. It is the customer's responsibility to pretest the dye lot on their substrate using their methods prior to full scale deployment. When using this product to meet DoD 4145.26-M the conductivity must hit very specific standards with minimum resistance ranges tailored to the voltage in the facility and maximum levels that are tested in conjunction with your footwear or heel grounders. The insulative properties may be adjusted upwards with an application of ElectraThane (generally one coat). Samples of your dye lot may be sent for testing prior to full scale use - pretesting the conductivity in combination with your footwear is recommended prior to full scale use. Note: All ESD thin set epoxy and ESD floor paints have particular nuances. For more on this please click here.